This week for your friendly neighborhood tipster started off with old email messages being continually syned to my device due to an odd issue involving email retention time frames and has continued with another weird issue of new text messages seemingly disappearing from the Messaging app as soon as they arrive. The phone would alert me that there was a new message and in some cases I would even see the preview of the message in the top listing of conversations in the Messaging app. But when I would go to the actual conversation, the message was nowhere to be found. In another case, a new message would be received but it didn't appear to show up at all in the Messaging app until I did a type-to-search for the recipient name and then found the conversation in the "LAST WEEK" section of the listing. Finally, in an even odder scenario, a message came in and was now showing under a "NEXT WEEK" section of the Messaging app. Did I just receive a text message from the future? Do I need to call Captain Kirk? As it turns out, there was no time travel involved here. I needn't to worry about humpback whales, Terminators, Romulans, the Borg or Cybermen, Biff, hot tubs, Daleks, loopers, or apes that can talk. But why did my Pre think the text messages were from next week? What ended up happening was the network time on my phone was randomly moving ahead or behind by about week. The text message would then be given a timestamp based on the phone's date and time at the time when the message was received and would be placed in the appropriate spot chronologically in a conversation. So, it's not that the message was missing from my messaging conversation, it just wasn’t showing up where I would have logically expected it. Had I scrolled through the conversation to the prior week, I would have found a very out-of-order and confusing conversation. And, this also didn't only affect text messages, but also the timestamp of screenshots or photos/videos taken from the camera, phone log records and more. I will never know why Verizon kept telling my phone to change its Network Time, but I do know a few fixes to help prevent or diagnose this issue in the future. You can install a program like Clock Sync to check that the phone's date and time are correct and then update it, if necessary. Unfortunately, since you will need to define a regular sync time period, this may not help if those random time changes are between time sync periods. If the wrong date and time is still showing up, you can always turn off the Network Time option and just manually set it. Finally, you may want to consider installing a homebrew patch like "Date and Lower-case AM-PM Indicator" or "Date As Carrier String" to add the Date to the top bar header of your device, as you can see in the screenshot above. This way, you can quickly notice if the wrong date is showing up and fix it, as indicated above. On the list of rare birds in the webOS universe, it doesn't get much rarer than the Verizon HP Pre3 before you venture into the realm of never-mass-produced prototypes. But it would just so happen that we have five of them that we intend to give away to you, oh loyal citizen of this great webOS Nation. You've haiku'd for the AT&T version, but given the comparative rarity of the Verizon Pre3, something more is called for. So here's the deal: To enter for a chance to win one of five brand-new Verizon HP Pre3 smartphones, we want you to put together a video explaining why you deserve to win one. There's just one catch: this video cannot be longer than 60 seconds. You've got one minute to make your case - no more - and though we appreciate your enthusiasm, we must insist that you limit yourself to one video per entrant. And one minute, that's really a big sticking point here. Once you've made your video, upload it to YouTube and post a link to it in the comments of this post. Your entries are due in by the end of the day on 30 April 2013, after which time we're sure it will take us a little while to sort through them all and pick the most deserving of entrants. As with the other giveaways in The Great webOS Nation Giveaway, there are also Touchstone and car charger bonuses to be had. Three for this one, in fact. To recap: 60 seconds to make your case for one of five Verizon Pre3s. Put it on YouTube and link to it in the comments. Do this by next Tuesday. Time to bust out that old JVC GY-X2B and get recording! 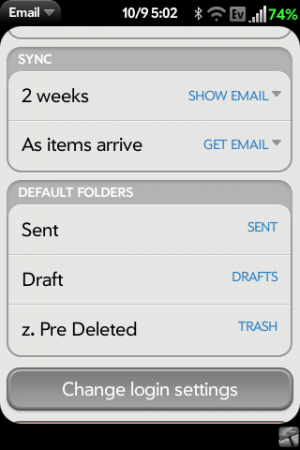 Instead of a fixed number of email messages to load into the Email app, webOS allows you to define a retention timeframe, so you can bring it all email from just the last day to a full month to everything in your mailbox. Generally, the app will follow the timeframe that you have set and only bring in those requested emails, but there are a few situations where this functionality becomes broken and requires a little intervention to fix. DO NOT tap the "Remove Account" button. Go back to the email's Account again and now switch the toggle from OFF back to ON. By doing this, all of the things tied to that Account--such as any linked contacts or calendars--will remain untouched, and any email account settings prior to removing the email will also remain. Another situation where we have seen the email retention timeframe fail occurred to this writer this past weekend. Every few minutes, the phone would vibrate telling me there were new emails, but nothing seemed to come through. In fact, the "new" emails that were being synced were actually very old emails, some that were from days or weeks before the defined email retention timeframe and no matter how many times I seemed to delete those older emails, they kept returning every few minutes. As it turns out, I had accidently deleted an older email while on my PC and then moved that file from the Trash back to the Inbox. For some reason, the webOS app must have been confused between the older date of the email and the more recent "modified" date of when I moved the file back into my inbox. From my computer, I moved that problem-email to a different folder in my email account to get it out of my inbox, and then be safe followed the directions above to remove and re-add my email account and everything was fixed! Monday Brief: The HTC One launches in the US, BlackBerry 10.1 for developers, and more! If you want to do any sort of file management on your webOS device, you will need to connect your device to a computer and access the USB drive mode, or you can use use a good File Manager app. There are quite a few great apps available, including Internalz or InternalPro by Jason Robitaille, Gemini File Manager by OMA Studios, or File Explorer and Archive Manager by pcworldSoftware. While each of these apps have their own unique benefits, one feature found in Internalz/InternalzPro and Gemini is the ability to bookmark those folders that you use most often for quick access. Press-and-hold on that folder until a pop-up menu appears and select "Info"
On the top-right corner of the screen, tap on to set this as a favorite. The star will turn to to indicate it has been set. Swipe-back on phones or Swipe-down from the top-left to access the dropdown menu and select "Back" to go back to the file manager. You can remove a bookmark by repeating the steps above, or just swipe-to-delete the folder from the "Favorites" page. To access the bookmarks, tap the icon again and you will see a list of all your bookmarks. I recently added a LG Nexus 4 to my smartphone rotation, and yes, that's an Android device. It's a nicely-designed phone and feels good in the hand, and as an added bonus to an old school Palm aficionado like myself, comes with built-in wireless charging in the form of Qi. For those unfamiliar, Qi is similar to Touchstone in that it's an inductive charging system, except that it's a standard that multiple manufacturers support with an array of cross-compatible devices and chargers. There's just one problem with Qi: there are no magnets for alignment and traction. Also, Qi isn't compatible with Touchstone, so I've now got four mobile device chargers going at once on my desk: phone Touchstone, tablet Touchstone, ElevationDock for iPhone, a new Nexus 4 Wireless Charger, and a Micro USB cable for all my devices not fortunate enough to be graced with wireless charging or a dock. As a Palm fan, that Nexus 4 Wireless Charger has been a particular point of contention for me thanks to its inherent inability to hold on to my Nexus 4, no matter how much I clean the back of the phone and the top of the charger (as the comments in my post on Android Central indicate, not everybody has this issue with the Nexus 4 Wireless Charger, but I'm also not alone in my problems). Enter Rod Whitby, a man that's no stranger to the webOS community as the chief of WebOS Internals. Whitby's also a man that loves to tinker, and he's taken to adding Touchstone charging to a wide range of devices, including an audacious hack that added dual Touchstone circuits to a Nexus 7 tablet. Like me, Whitby was disappointed by the design of the Nexus 4 Wireless Charger (though, he has yet to get his hands on one, being in Australia and all). And being Rod Whitby, he took matters into his own hands and rather quickly opened up the back of the Nexus 4 and hacked in a Touchstone coil. What came out at the end he describes as "the world's first mult-wireless-charging phone," as the larger Qi coil still works with the Touchstone coil layered on top of it. Whitby reports that everything fit back together and that the phone is "fully operational". Additionally, in his testing the Touchstone charger seems to charge his Nexus 4 "significantly faster" than the Qi charger he has on hand. While the phone can now charge from three different sources - Micro USB, Qi, and Touchstone - there's still work to be done. In particular, Whitby still needs to solve for this Touchstone hack the problem that afflicts the Nexus 4 Wireless Charger: he currently has the Touchstone coil installed but nothing to hold the Nexus 4 in place on the Touchstone charger. There are two options: install metal discs in the back of the Nexus 4 (Palm and HP webOS smartphones have metal discs that are drawn to the magnetic mass inside the Touchstone), or if that's not enough to keep the phone in place through its glass back, then small magnetic discs will be the order of the day. So there you have it: even on a phone that's over a year removed from the last webOS devices and using the latest Qi wireless standards, the old standby Touchstone inductive charging system offers faster charging and a better user experience. It's one of the little things we're going to be able to crow about for years to come. One thousand entries, took Derek a while to read, so many good poems. But when the end comes, there can be just one, no, four, to get a new phone. webOS haikus, funny, sad, joyful, clever, picking was quite hard. So here are the four, who will win a new Pre3, for AT&T. These last two haikus, have also won a Touchstone, and a car charger. Thanks for the haikus, everyone who entered, your passion is great. A community like this, a platform would be lucky, to have on their side. Winners: watch your mail, we'll be contacting you, for delivery. webOS Nation, giveaways are still going, more winners to come. There's one on right now: Pixi, Pre 2, and a Veer, just comment to win. Thanks again to all, without your passion and zest, we would not be here. If an AT&T HP Pre3 doesn't fit the bill for you, fret not, there are more giveaways to come in The Great webOS Nation Giveaway. Like this one. And unlike the last one where we told you to go and write a syllabically-constrained webOS poem (that contest is still open through tomorrow, by the way), all we're going to ask of you this time is to post a comment on which one of these fine devices you'd like to win. What's up for grabs? You might call this the odd lot, with a mix of webOS smartphones old a new available. Again, you'll have to specifically comment on which one - just one - you'd like to win. There are two AT&T HP Veers, two Verizon HP Pre 2s, and one Sprint Palm Pixi. The Veers come in new condition with all of their in-box goodies, while the Pre 2 and Pixi prizes are offered without accessories. Additionally, one of the winners of one of these five fine webOS smartphones will be getting a Touchstone wireless charger and a Palm car charger. And all you have to do is post a comment on which one you want to win by Tuesday, 23 April 2013. As a reminder, you have pick one and only one, and repeat entries will result in disqualification. Who wants a free little phone? You do!